Early years will be one of the most exciting learning experiences of your child's life. During this critical time, a variety of developmental and academics milestones are met in a fun and social environment. Through experiential learning and discovery, children develop the desire to learn and the confidence to express themselves. Students who complete our Pre-K program emerge ready for the opportunities and challenges of kindergarten. The HighScope curriculum takes the learning process beyond traditional academic subjects by applying methods that promote independence, curiosity, decision making, cooperation, persistence, creativity and problem solving in young children. AISK’s trained early childhood teachers provide educational experiences and materials that help children develop language and thinking skills that are the foundation for elementary school. 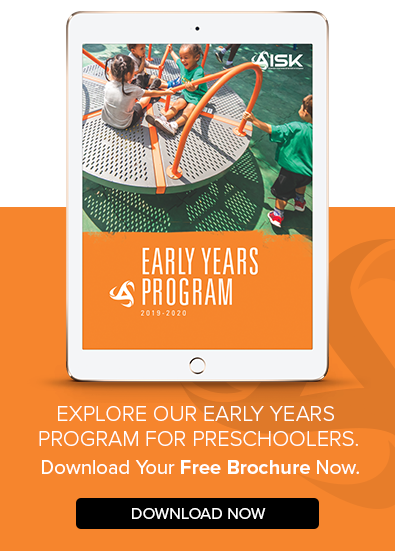 Discover more about the benefits of each learning center in our Early Years E-Brochure. Learn More About Pre-K at AISK! Are you looking for the best preschool environment for your child? Schedule a tour at AISK to experience our community. Complete the form below and someone from our admissions team will be in touch with you soon.